PVC !!! Show us your PVC, Build, add-on, rod holders, ETC. Any with PVC pipe! Full chest logo/iceshanty.com printed down the sleeve.
" I Don't Fail … I Succeed In Finding What Does Not Work "
Re: PVC !!! Show us your PVC, Build, add-on, rod holders, ETC. Any with PVC pipe! Excellent! Awesome start you two and unique builds. Thanks for posting your Pictures. Rod holders, scoop holder and back auger mount on my glide lite. Painted black with rustoeum textured plastic paint. Thanks for sharing your build. Well I have been out in the garage tinkering as part of my "Pack Lite" project. "Pack Lite" has become a necessity with all the slush & snow this season, that and snowshoes. As part of the "project" , I have added a removable carrier to my one man shack for my power-auger and a hole-hoppin` bucket. Will post pics of this build also,as it utilizes PVC board as well. My Hole Hoppin` bucket is a modded 5 gallon RedSox bucket. I cut off the bottom portion of another bucket and slid it inside of the RedSox bucket to give me 4" of lift and storage space. Then I added the PVC rod holders to the rear of bucket(faces away from hole) and mounted a flashlite holder to the front of the bucket(faces holes) to charge glow jigs/lures. Also cut a keeper hole in front of bucket to keep the catch outta site-outta mind. When draggin out to my spots the bucket holds a short bait-bucket in the bottom with the Vex on top. Skimmer hangs to my rite for easy access as well. Seat swivels for a quick look-see of wasup. 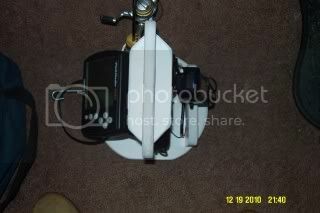 Now I pick up my Hole Hoppin` bucket and the Vex and it`s off to the next hole. Added a Gulp Holder, to the rear of bucket using an old tape measure holder from a workbelt, Holds 2 jars snuggly. Also added a waxworm holder to side of bucket using an old snowboard leash clip and a boat keyfloat, clips on and off so you can put it in your pocket on cold days. Forgot to add a pic of my tip down. All 1/2inch pvc pipe and fittings. Including the rod and paint cost was about 12bucks and an hour of work. I had snagged that pic of your tipdown to copy, hope ya don`t mind. I will be making 2 of them as part of my "PackLite" plan. Are you happy with how it works for you? I figured it would be a good way to capitalize on a spot that was producing and also a way to possibly increase my catch when the bite is tough. nope no problem they work great. Right on everyone. Thanks for showing us your PVC projects. Great Holders and tip-downs Bart! How is the sled doing? jjc155 - Nice idea for a solid base and tip-down. I bet she is sturdy. JJC.... do you have so more pics from a different angle of the head of that tip-down please?? Thanks, didn`t take long to put it together. I have access to scraps of PVC board and use em during the summer for projects. Made sum nice speaker wall mounts and floor stands for my surround sound too. 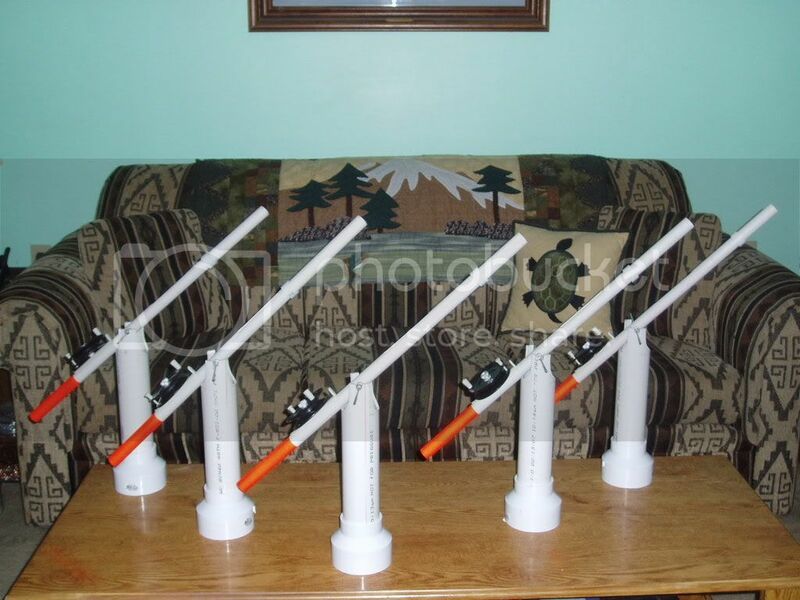 Ok, who had a chance this summer to make anything ( Ice Fishing related) with PVC pipe this summer? The fishie says "Why you looking at me like that?" Here's some mods i did to my sled last winter. The end rod holders can be at a slant as is or can be turned to be straight up. Such fun doing mods. Best part about building a rod holder version like yours is, that it keeps all your rods up right and allow's very easy access. Nothing gets tangled and it makes it easy to pre - rig up different rods with different lures or baits and then grab and do a fast quick change of a rod, fast and easy. Functionality , over fancy anytime. Builds what works for you and go for it.. and your right it is and can be fun.. easy to try something and then change it later.. Remember to build what ever works for one's own needs. Thanks for sharing.. Have a Great Winter Season and the best of luck. I want to play. I built this this fall for the Chickens to have fresh water that doesn't get dirty nor will it freeze. 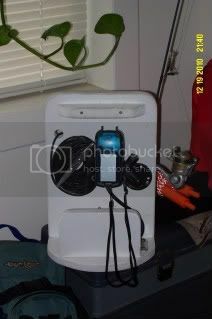 I have a Pump inside the cooler and a Heater for cold nights. The cooler holds 17.5 Gallons so I don't have to fill it often. Thanks brother you just made my day. That is a very cool set up, for sure. Brings so many questions to my head. - Like how hard is it to train chickens to drink from the pipe area. and I suppose they just press there beaks against the metal insert and they get drops of water? Excellent. Thanks again " lefty2053 "
I am beginning to think that there is so much we can make and have fun with this stuff called PVC .. LOL ..
AltaIce, you are PVC mods guru. You've seen mine, I still use the rod holder and tip-downs all the time. 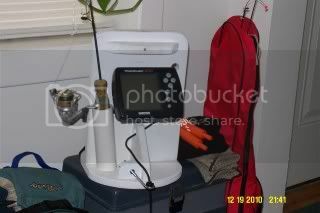 Lefty, nice waterer setup. 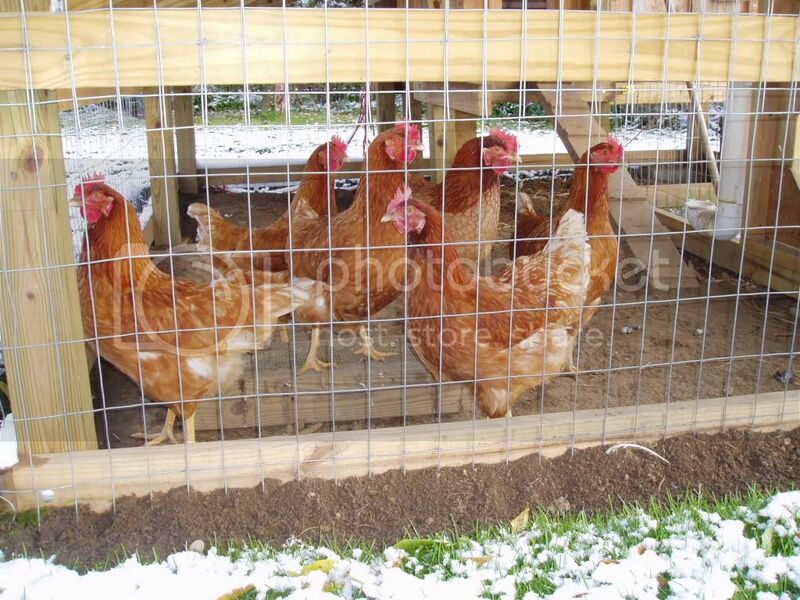 Lost my hens last winter to a mink, maybe this spring I'll get some new birds? "BART !!!!" How are Ya doing Bro. Long time, Eh. Hope you and yours have been doing well. Ahhhhhhhh, thanks what you said. but I stand by what I said before… I always thought about working with PVC.. and put it off for so long, until I saw your sled and all of it's PVC. Your the ONE that gave me the idea that it could be done.. Thanks again. I love your tips ups. But I have one question. Do they tip over at all. Was wondering if the bottom was big enough? SEE "LEFTY" It was just fine that you showed your PVC watering system. Your not the only one that has or have chickens. Lefty, I am glad you showed your Idea. nothing wrong with that at all Sir, nothing at all. Great idea! Take Care All. Once again, great to hear from you Bart. AltaIce, You've seen mine, I still use the rod holder and tip-downs all the time. id get a .22 and shoot/trap that mink if fur prices are up! A bad day of fishin is still better than a good day at work!! Yes they just push up on the feeder and the water comes out. They were playing with the feeders before I had water in there so they taught themselves. The bottom pipe has water pumped into it from a Pond pump in the cooler. The return line drops the water back into the cooler. The feed line is 1.5" and the return is 3/4 " The heater only comes on when it is below 32 and the pump will shut off if the water level gets to low. I found the idea on Youtube. Nice setup for the chickens, but what about turkeys? Prolly won't work for ducks, plus the ducks waste ALOT of water if they don't drink out of the pond, 17.5 gallons would only last me a day with 14 ducks. I have a waterer with a float for summer, but I need a way to either give the ducks constant water or not waste water in the winter. Now you got me thinking. That is a really neat set up , but how do the chickens even know it has water in it?Is the water constantly being pu mped and it is recirculating or what?Being in South Dakota it gets real cold and i don't believe i can do this in the winter but am going to have to do something like this in the warm season cause i'm so tired of cleaning out their waters cause there always full of dirt and straw.You definetly got the ball rolling here.Thanks. Page created in 0.016 seconds with 26 queries.